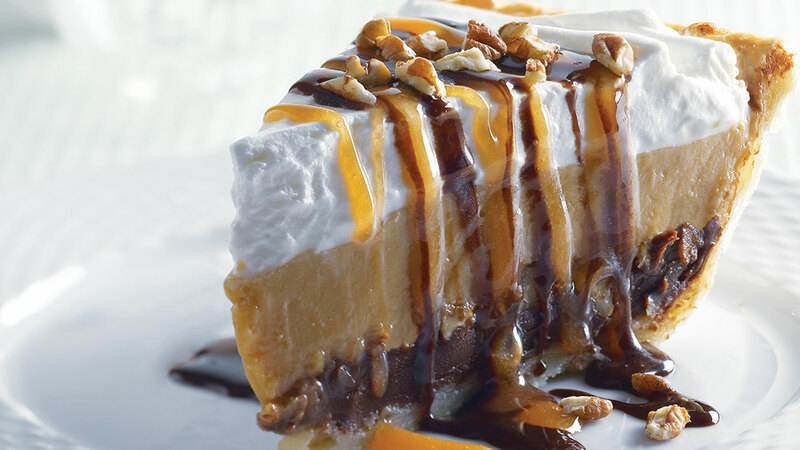 In our book, you can’t go wrong with chocolate, caramel, or pecan pie in any form. Combine all three in one pie, and the result is sheer unadulterated bliss! I’m not going to lie—this pie was a labor of love that took weeks to get just right, but when I did...well, let’s just say it was quite a moment. If cream pies are your thing, I guarantee you’ll love this one. As a bonus during this usually hectic season, baking is kept to a minimum—only the crust requires oven time. Even better than that, this showstopper can be made in stages and completed before your guests come knocking. Just remember to pull it from the fridge about an hour or so before serving in order to give the chocolate ganache layer time to soften. Patience is the key to the caramel pastry cream layer. The very hot caramel will sputter when the heated milk mixture is whisked in, and some of the custard may appear to curdle on the sides of the pan. Just continue whisking, and any lumps eventually will disappear. Prepare pie dough and roll; blind bake; cool to room temperature, about 10 minutes. Combine 3/4 cup cream and syrup in a small saucepan and bring to a boil. Pour over chocolate in a small bowl, let stand 5 minutes; whisk until smooth. Transfer ganache into cooled pie shell, top with 1 cup pecans; press into ganache. Meanwhile, prepare caramel pastry cream. Boil granulated sugar and water in a saucepan over medium heat for the caramel, swirling occasionally, until the Whip 11/2 cups cream with powdered color of iced tea, about 15 minutes. Meanwhile, whisk milk, brown sugar, and cornstarch together in a sauce- pan over medium heat until blended. Whisk in egg yolks and salt. Do not let milk mixture boil. When the caramel is done, slowly (while whisking constantly) pour the milk mixture into the caramel. It will sputter; sugar in a bowl with a hand mixer on high speed until fluffy. Just before serving, top pie with whipped cream, spreading it to the edges. Drizzle with caramel and chocolate syrups and garnish with remaining pecans after slicing.